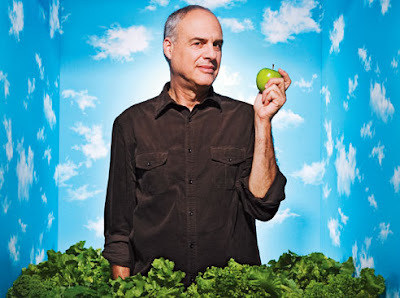 Mark Bittman is a New York Times columnist and cookbook author. He's not a professional chef. Just a regular guy who cooks good food. He focuses on simple, comfortable food, and he inspires me. I read his article (and watched the video) about bok choy and thought 'I could do that.' 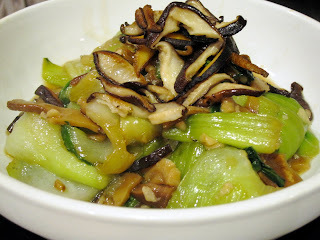 This was my first time to ever eat bok choy, a chinese leaf vegetable, and it's good! 1/2 to 3/4 cup commercial oyster sauce. 1. Soak shiitakes in one cup of very hot water until tender, about 15 minutes. Drain, reserving liquid. Trim mushrooms and chop. 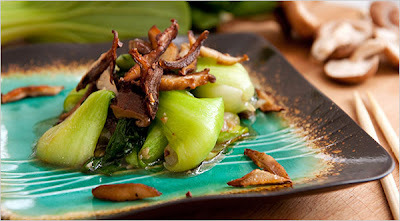 Separate leaves and stems of bok choy; cut stems into 2-inch lengths and slice leaves into ribbons. 2. Heat 2 tablespoons oil in a wok or large skillet over high heat. When oil is hot, add bok choy stems, garlic if you are using it, reconstituted mushrooms, and about 1/4 cup reserved mushroom water. Cook, stirring frequently, until stems are crisp-tender, about 4 minutes. 3. Meanwhile, in a small skillet heat remaining 2 tablespoons oil; sauté fresh shiitake mushrooms over medium-high heat. Continue cooking until they begin to brown and crisp on edges. 4. Into the large skillet or wok, add bok choy leaves and oyster sauce and toss vegetables gently to combine; continue cooking until greens wilt, about 2 more minutes. Serve immediately, topped with crisp mushrooms.